After years of Honda owning the market on the ultra portable inverter generator with the EU2000i they have rolled out a new more powerful EU2200i unit. So What’s the Main Difference? It all stems from the new GXR120 power plant. This new 121cc engine replaces the 98.5cc GX100 engine currently used in the EU2000i. With this new larger engine they were able to up the rated output form 1600 watts to 1800 watts. And as the model number suggests the max output goes from 2000 watts to 2200 watts. It’s not all rainbows and cookies in the new model though. There are a few minor hits the EU2200i takes for this bump in power. Run time drops from 3,4 hours to 3.2 hours at rated load. Oddly enough it retains the same 8.1 hour run time at 1/4 load. This is all from the same 0.95 gallon tank as the previous model. Along with run time the noise level follows an idetical slight bump up. At rated load we go from 59 dB on the EU2000i to 62 dB on the new EU2200i. And once again at 1/4 load the noise level remains an ultra quiet 53dB. And finally the weight ticks up by 0.9 lbs going from 45.6 lbs on the EU2000i to 46.5 lbs on the new EU2200i. Are these significant drawbacks? I’d say no and very much worth the 200 watt bump. Anything Changed Other than Specifications? The most significant change outside of the pure specs would be the addition of a fuel shut off valve. This is a very welcome feature which aids in running your carb dry when storing your unit for off season times. Some people would rather store with fuel stabilizer but mist will agree running a unit dry is the easiest and most fool proof way of storing your generator. This is a bold move by Honda but very safe at the same time. 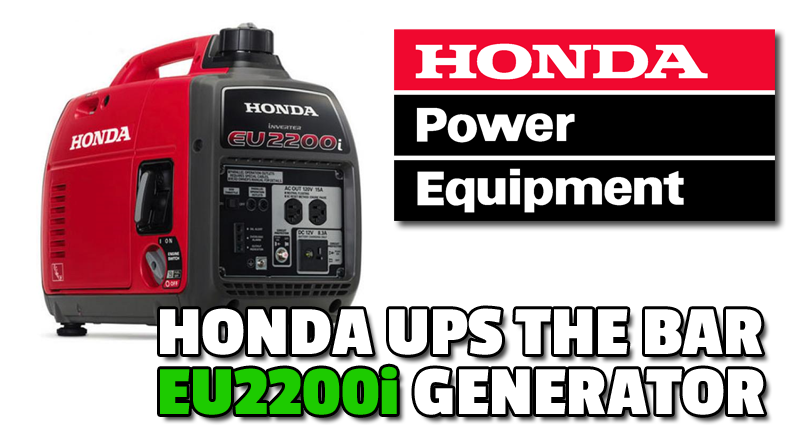 The Honda EU2000i was already the best selling and most popular portable inverter generator on the market. It’s known all throughout the camping world as being the go-to unit in it’s size. From a reliability standpoint it has proven itself to be dang near bullet proof. So a super safe move to jump bump the specs and run away even more from the competition right? Well yes but many know it can also be like playing with fire when you take a product so popular and attempt a replacement. We have seen this bomb occasionally but Honda is not the sort of company to rush things to market nor would they want to shoot themselves in the foot on such a high profile item. Because of this you can assume this model likely received more testing and vetting than other product releases.